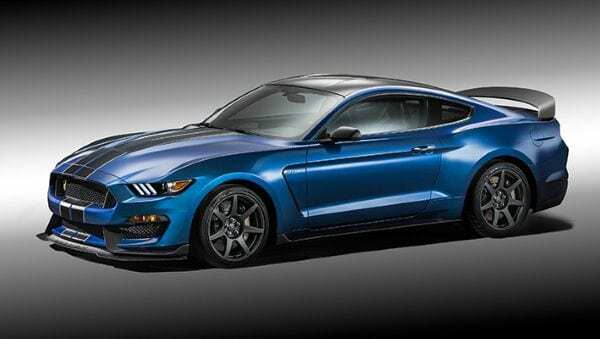 Ford has announced that it intends to build just 37 models of the raucous, track-honed Shelby GT350R Mustang. If you like it, better get your order in quick. The GT350R is, of course, the hardest ever Mustang in history. It was revealed at the Detroit motor show earlier this year, sporting an extreme diet, fancy dampers, a 500bhp+ V8 and trick aero. So, on the 50th anniversary of the Shelby GT350, the Blue Oval confirmed that this pointy, track-ready Mustang with no rear seats, air con or boot carpet, though boasting carbon fibre wheels and naturally aspirated flat-plane crank V8 instead, will be built in very limited numbers. Why 37, you might ask? Well, if you are a Shelby enthusiast, then according to Ford, you will at some point in your life have come into ‘heated debate’ about the number of 1965 GT350 competition models originally built. Yes, heated. “Carroll Shelby insisted two prototype cars and 35 production models were built,” says Ford, “but most records show only 34 production models received serial numbers from the Shelby production facility. “For 2015, Ford will make sure there is no confusion about the number of GT350R models constructed: 37 cars will be built in Carroll Shelby’s memory.” So, that’s that. If you miss out on one of the 37 cars – which also feature a Torsen differential, a new aero package and adjustable dampers retuned for a lower ride-height and 59kg-lighter kerbweight – you can always scamper after the ‘standard’ GT350. For 2015, 100 GT350s will be built before switching to 2016 MY designation. Of these 100, 50 will be fitted with the ‘Tech Pack’, and 50 with the ‘Track Pack’. Still no word on price, though, so stay tuned.